Nicole's Needlework: Lots Going On! Well, we've owned this house for a little over a month now and it's still hard to believe that it's ours. 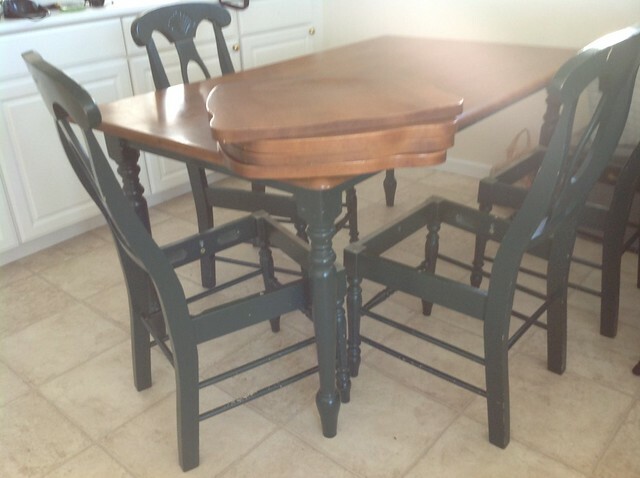 We finally got around to painting the table and chairs black. We were going to go through all these steps and we ended up just using spray paint and I think they turned out great (and again, when I say we, I mean Chris). He did a great job! So much better! They were pretty beat up! 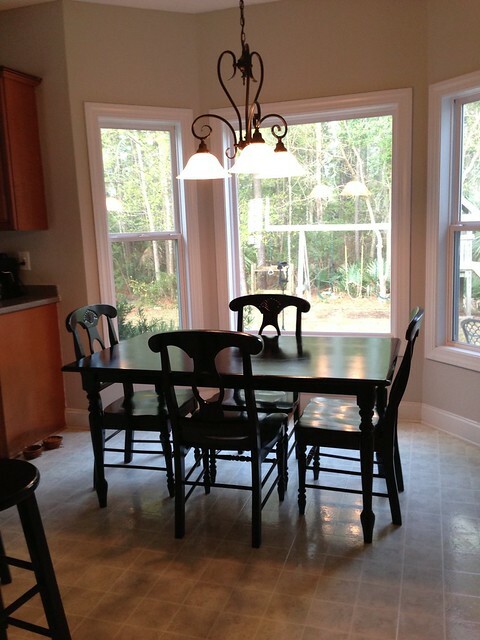 Chris also painted the barstools to match. 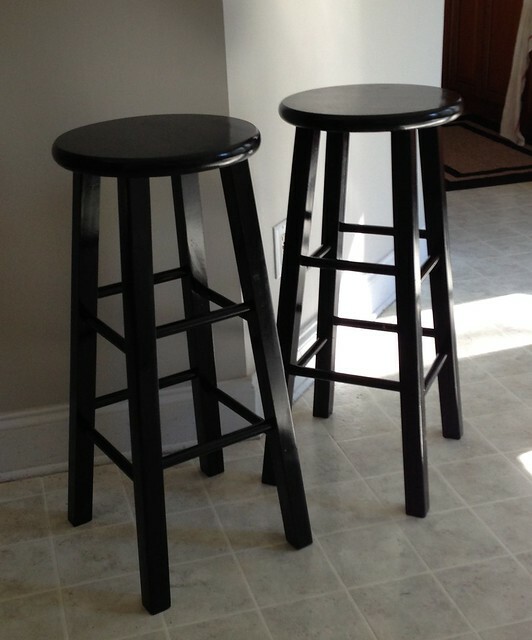 These are just cheapo stools from Wal-Mart! We just got back from Florida where we spent spring break. We spent Easter weekend with my dad and then the week after with my mom. The boys had so much fun in the warm weather - swimming and playing outside. They were glad to be out of the cold and so was I. While in Florida, I picked up a couple things at IKEA. 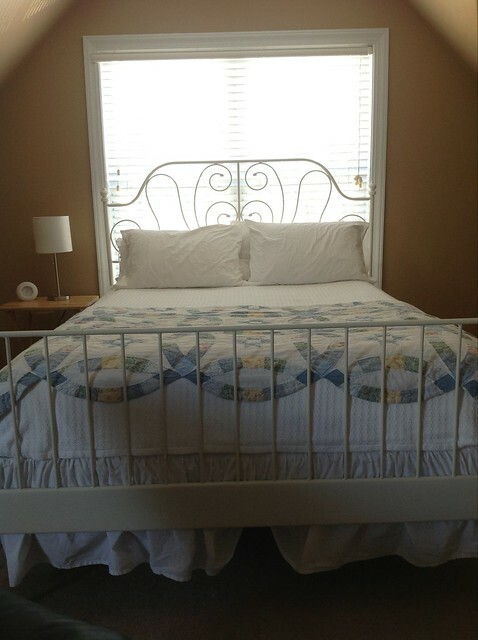 First, I found the cutest bed for our guest room/bonus room. 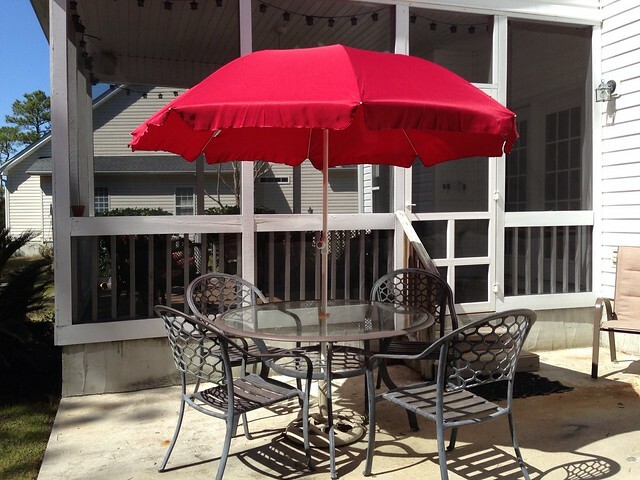 And then I found a pretty outdoor umbrella for our patio set. I'm having fun decorating our new house, but now I'm ready to stitch! I have been working on Ruth Bacheler quite a bit lately. I also started Dutch Beauty. I keep asking myself what I'm thinking starting something so big! It's so pretty though, and I think it will look great over my bed one day. I really decided to start after seeing Paulette's finish. 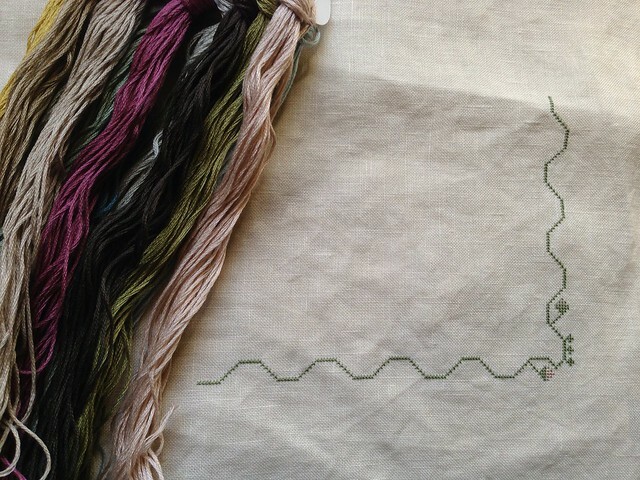 I'm stitching it on 40 ct. Bisque, which I coffee-dyed to make it a little more cream and I'm using DMC threads. I'm so envious! Your house is so pretty and light filled. I love that bay window area in the kitchen - something I've always longed for! Your house is shaping up nicely! So exciting to decorate! Ruth looks great! Great start on DB too! Have a great evening Nicole. Everything looks fabulous! I just got the Ruth Bachelor chart and have had the Dutch Beauty chart for years. After finishing Shores of Hawk Run Hollow in 2011 I've been putting off starting another humongous sampler. Maybe this summer, you'll inspire me no doubt! Your house is looking great! Ruth is beautiful...DB will be amazing! Love, love, love your new house!!!! Congrats again :-). And Ruthie is gorgeous. I'm a take your time kind of decorator. It has to be something I've seen and love, loved that would fit into that perfect spot before I'll commit. Thinking that you'll be there for many years, it's ok for you to build your decor! All that painting that you guys are doing sure is coming together!!!! And I LOVE your new start!!! It huge, but a stunner... Ruth has been a long time favorite of mine although I don't own the chart or threads.... I will definitely be putting it " on the list "..... Great photos and purchases.... Don't you love finding things at places like Wally World and turning them into something real nice ???? Nicole, everything is turning so nicely! I'm really enjoying seeing your pictures and how you guys are making your new home your own. DB will look wonderful over bed. Actually, it looks like you've got a lot of great wall space to hang samplers! It's been so much fun watching you pull your house together! And your stitches, as always, as gorgeous! Well done on all the painting, and great going on the samplers. i can't wait to see your start on dutch beauty, its on my one day i will get around to doing it list :) your house looks pretty too. Ruth is beautiful and so is your home! Everything in your new home is coming along nicely! The table and chairs do look so much nicer in black and the bed is pretty. 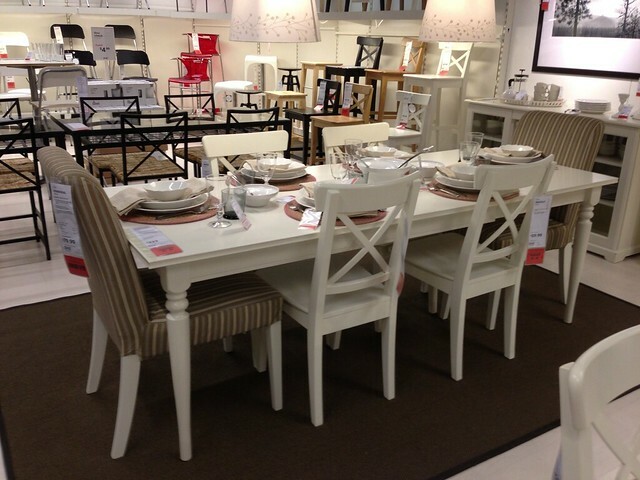 Love that dining room set! 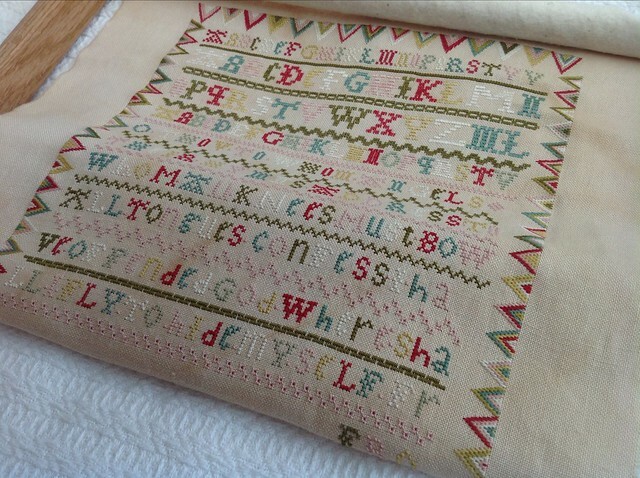 Ruth Batchelor is gorgeous...she is such a stunning sampler. I enjoy seeing your progress on her. Your house and samplers look wonderful. Thx for the Hannah Pepper sampler tip! I enjoy looking at your blog and seeing your works come alive! 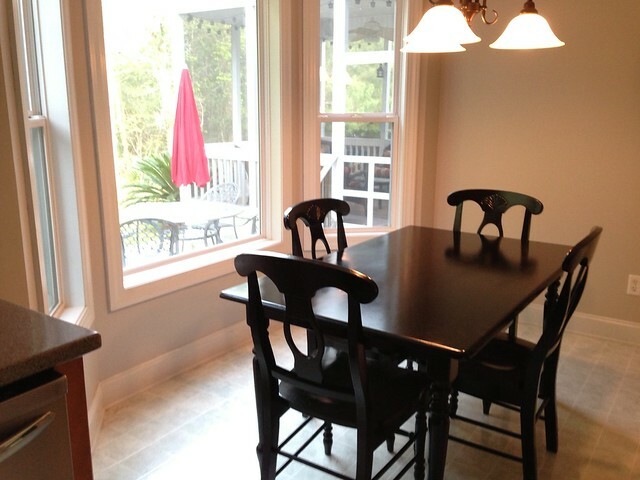 Your house looks lovely, you did a great job on the table and chairs. Your new bed is really pretty. Great new start and Ruth is growing too. I'm so sorry I missed you! The only color change I made was 842, which I changed to 3864, so it would be just a tad darker.